This is Tobacco Free Awareness Week. While smoking rates in America continue to drop with every year that passes, the costs of smoking continue to rise - not just health wise. 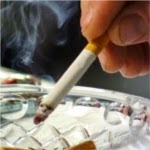 The personal, health and financial costs of smoking cigarettes are staggering, more than one might ever imagine. A new study has found that an average of $1.4 million goes up in smoke per person in a lifetime, CBS News reports. Researchers calculated the cumulative cost of a cigarette pack per day over a 51 year period, between the years of 18 and 69, the average age a smoker passes away. Next, researchers factored in how much smokers would have earned if they placed their money into the stock market. When you couple the two factors together, tobacco costs an average of $1.03 million after a lifetime of smoking, the study found. Naturally, in southern states where American tobacco is grown, taxes are lower, which means the lifetime cost of purchasing cigarettes was significantly lower than the country’s average. The highest smoking costs were found in Alaska ($2.03 million). After Alaska, the highest smoking costs were found in: Connecticut ($1.99 million); New York ($1.98 million); Massachusetts ($1.98 million); Rhode Island ($1.95 million); New Jersey ($1.87 million); Hawaii ($1.85 million); Washington, D.C. ($1.75 million); Vermont ($1.74 million); and Washington ($1.67 million). The 10 states with the lowest smoking costs are: South Carolina ($1.1 million); West Virginia ($1.1 million); Kentucky ($1.1 million); Mississippi ($1.15 million); Georgia ($1.15 million); Tennessee ($1.17 million); Alabama ($1.18 million); Missouri ($1.18 million); North Carolina ($1.19 million); and Louisiana ($1.2 million). The findings can be found on WalletHub.